According to Heat Vision, casting on Lucasfilm’s Han Solo movie is kicking into high gear. With The LEGO Movie helmers Phil Lord and Chris Miller directing the still-untitled Star Wars Anthology film, they’ve brought on their casting director Jeanne McCarthy (the 21 Jump Street films) to cast a wide net (over 2,500 actors seen so far) for filling Harrison Ford’s iconic role. 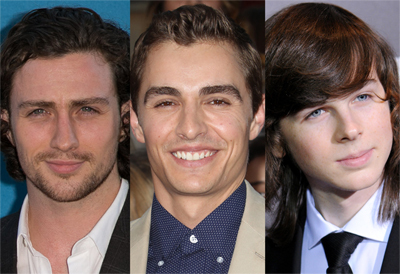 Despite Kathleen Kennedy saying the character would be in his “high teens, low 20s,” they’ve auditioned high-profile names like Aaron Taylor-Johnson (Avengers: Age of Ultron, age 25), Miles Teller (Fantastic Four, age 28), Hunter Parish (“Weeds,” age 28), Dave Franco (21 Jump Street, age 30) and Rami Malek (“Mr. Robot,” age 34). Young thesps that have either read or sent in a tape who fall more into the range Kennedy identified are Chandler Riggs (“The Walking Dead,” age 16), Leo Howard (“Kickin’ It,” age 18), Nick Robinson (Jurassic World, age 20), Ansel Elgort (The Fault in Our Stars, age 21), Jack Reynor (Transformers: Age of Extinction, age 23), Logan Lerman (Fury, age 23), Landon Liboiron (“Hemlock Grove,” age 23) and Tony Oller (The Purge, age 24). Keep in mind that the prequel/spin-off doesn’t begin shooting until January 2017, so that gives some of the younger candidates an extra year to age into the character and more time for Lord & Miller to make a decision. Yet other names under consideration include Colton Haynes (“Teen Wolf,” “Arrow,” age 27) and Max Thieriot (“Bates Motel,” age 27) as well as English actors Ed Westwick (“Gossip Girl,” age 28), Tom Felton (the “Harry Potter” films, age 28) and Joshua Sasse (“Galavant,” age 27). There is no mention of an audition by fan-favorite Anthony Ingruber, whose dead-ringer looks led to him playing a younger version of Harrison Ford’s character in Age of Adeline. The screenplay for the Han Solo movie is written by Lawrence Kasdan and Jon Kasdan and will focus on how young Han Solo became the smuggler, thief, and scoundrel whom Luke Skywalker and Obi-Wan Kenobi first encountered in the cantina at Mos Eisley. Technically, the new film marks the second Han Solo casting from Lord and Miller. Voice actor Keith Ferguson played the part in their The LEGO Movie. Now, though, the search is on for a new star to take over the role made famous by Harrison Ford. According to Kennedy, the new Han Solo casting will aim for an actor about 15 years younger than Ford was during Star Wars. Slated for a May 25, 2018 release, the Han Solo movie will be executive produced by Lawrence Kasdan and Jason McGatlin and co-produced by Will Allegra.